Because an awesome team of people pay me to write blog posts, I had the honor and opportunity this week to go through the first edition monster manual and index every monster with its appropriate treasure type, to determine what the treasure types mean and how they work in play. I learned a couple of bizarre and fascinating things. What treasure type is assigned to only one creature? What do the various treasure types represent? What do treasure hoards say about the nature of the base Dungeons & Dragons setting? What's the average gold value of each hoard? What monster is the best to kill? First, it's important to address the very important text under treasure type. These treasure types are not applicable to monsters found in dungeons, only wilderness lairs. What Can We Learn from Treasure Types? It's super confusing at first glance, because most treasure types seem to be quite similar AND different monsters have multiple treasure types. Any sort of conclusions you're going to be able to draw are heavily obfuscated by the presentation of the data. Certain Treasure Types are assigned based on the type of monster. Type C, for example is the hoard present from creatures that are likely to eat adventurers and not collect treasure for the sake of collecting treasure. Meaning Type C represents what lots of dead adventurers might leave behind. 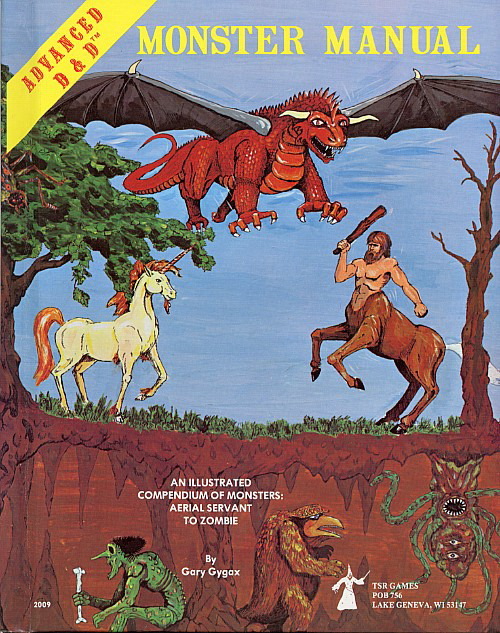 Types of monsters with Treasure Type C include Carnivorous Apes, Giant Beavers, Giant Boaring Bettles, Catoblepas, Giant Eagles, Ettins, Gargoyles, etc. Things that are likely to slay a lot of men, but remain unconcerned about the accumulation of treasure. Several creatures (around 3) have Type C (Magic Only) which is a 10% chance for any 2 magic items, this is usually found along with a scattering of individual treasure types. Gems (Treasure Type Q) are clearly the most common as well as most frequent type of treasure in the monster manual. Not only is it the most assigned treasure type, it's the treasure type that's most likely to have a multiplier (x5 or x10) listed after it in the description. Potions (Type S) are usually found with other larger hoards. Unusual creatures that have potions in their hoards include Griffons and Treants. Giant Ants only have gems and potions, which is interesting. Scrolls (Type T) are also usually found as parts of larger hoards among spell-casting or using creatures, but interestingly enough, common among Ghouls, Ghasts, and Shambling Mounds. Where did the rotting vegetation get the scroll? Of note about individual money, elves are only likely to have platinum coins. Treasure Type Y is basically a huge hoard of gold (70% for 2,000-12,000 gold coins), and is only possessed by a few monsters, including Ettins, Lurker Above, Medusa, Sea Hags, and Xorn. Treasure Type V grants 2 of each type of magic item excluding scrolls and potions, with an 85% chance. It is only found with Demogorgon, Asmodeus, Baalzebul, Bahamut. . . . and Dragon Turtles. Not even dragons have hoards this rich. But Dragon Turtles? Back off. Treasure Type I is for rich folks only. Platinum, Gems, and Jewelry and a 15% chance for a magic item. Unsurprisingly smart, powerful, opponents tend to have this type, including Beholders, Coutals, Ki-Rin, and Sahuagin. Unusually so, Winter Wolves do also. Treasure Type O is a pile of crap. Copper and silver. Type P isn't much better with only silver and electrum. Who's carrying that around? Brownies, White Dragons, Weed Eels, Imps, Kobolds, and Subterranean Lizards. Type H is a dragon hoard, shared only with Guardian Nagas. Type G is a rich hoard, devoted to the type of creature that will trade away more worthless metals and acquire more valuable items. It includes creatures such as Dwarves and Elves, Shedus and Umber Hulks. Strangely it also includes trappers, which would indicate it never traps anything with less than gold coins (or possibly it consumes the more base metals). Type F is a weaponless hoard, one filled with coins and magic, but no weapons and armor. Basalisks, Leprechauns, Rakshasa, Shadows and Vampires make up the bulk of creatures in this section. Other creatures which would melt metal weapons and armor Remorhaz's and Salamanders are also located here. This is basically the inverse of Type B hoards, which have close values, but only a chance of weapons or armor. Type R is Treasure! Gold, Platinum, Gems and Jewelery only! In addition to the usual suspects of Demon Lords, Devils, and Fiends, you'll also find Dwarves, Ghasts, Pixie's Titans, Wearbears, Merment, and Giant Octopuses with this treasure. Only 1 creature has Treasure Type W, and that's the Buccaneer. It's a bunch of rich treasure, like type R, with the singular addition of a 55% chance for a treasure map. Fitting for pirates, isn't it? Dragon Turtles are the wealthiest mortal creatures on the planet bar none. Humanoid tribes have rich hoards, often equivalent to single powerful creatures such as Liches and Beholders. Rust Monsters only have Gems. Genie, Djinn, Effreets, and other elemental spirits possess no treasure of their own. Dryads always have 200-800 gold, in addition to a ton of gems. Minotaur Lizards are weird, being a good example of a treasure type that represents singular opponents being slain and consumed. It has all of the pocket change entries, as well as gems and Type C (Magic Only). This pattern is duplicated for Strangle Weed, and Giant Spiders also. Men are rich! Merchants in particular, but also bandits, nomads. Hell, pilgrims have a 5% chance of having an artifact. Super interesting. Treasures types descriptors seem way more usefull (and interesting) than the classic letters code. And of course there is the escalation among individual treasure among humanoids based on hit die value, with kobolds having the least valuable copper coins (J). This rises in a stepwise fashion with progressively tougher humanoids holding mire valuable metals. Also demi humans are categorically better than humanoids. Based on hit die, the demi human will tend to have better individual treasure (and superior armor class). Gotta go find me a dragon turtle! Have you considered putting together a similar analysis for OD&D, B/X and BECM? The whole "not for dungeons" thing was clearly honor in the breach. Or really, in the totally being ignored. Even reading again years later, I was struck by that line and thought, why would I ignore treasure type? It's so much more useful than the treasure by dungeon level, IME. Well I suppose the pilgrims may have a *relic*, no doubt filched from the shrine they were "visiting". I always overlooked the caveat that these are for wilderness adventures. Hmm. "These treasure types are not applicable to monsters found in dungeons, only wilderness lairs." "The use of treasure type to determine the treasure guarded by a creature in a dungeon is not generally recommended." you may be misinterpreting it. "not generally" is different from "not". I read it as saying that a monster may not have its lair in the dungeon. The treasure that they are guarding may not be theirs. That doesn't mean that they don't have lair treasure, only that they are not in their lair. e.g. a minotaur may be taken and trapped in a part of a dungeon to guard a treasure that is not theirs. Its own lair treasure would be back in its lair or subsumed into that of the creature that captured it. However if the minotaur came of its own free will and made its lair in the dungeon then it would have lair treasure. You need to decide on a case by case basis. How do these treasure rules interact with the dungeon treasure rules? Why the HELL are Ghosts so rich? 3-4 4hd creatures with type R treasure? Wtf?